“Implementing Domain-Driven Design” presents a top-down approach to understanding domain-driven design (DDD) in a way that fluently connects strategic patterns to fundamental tactical programming tools. Vaughn Vernon couples guided approaches to implementation with modern architectures, highlighting the importance and value of focusing on the business domain while balancing technical considerations. Building on Eric Evans’ seminal book, “Domain-Driven Design,” Vaughn presents practical DDD techniques through examples from familiar domains. Each principle is backed up by realistic Java examples—all applicable to C# developers—and all content is tied together by a single case study: the delivery of a large-scale Scrum-based SaaS system for a multitenant environment. Vaughn Vernon, the author, takes you far beyond “DDD-lite” approaches that embrace DDD solely as a technical toolset, and shows you how to fully leverage DDD’s “strategic design patterns” using Bounded Context, Context Maps, and the Ubiquitous Language. Using these techniques and examples, you can reduce time to market and improve quality, as you build software that is more flexible, more scalable, and more tightly aligned to business goals. Read “Domain-Driven Design Distilled.” Domain-Driven Design (DDD) software modeling delivers powerful results in practice, not just in theory, which is why developers worldwide are rapidly moving to adopt it. Now, for the first time, there’s an accessible guide to the basics of DDD: What it is, what problems it solves, how it works, and how to quickly gain value from it. Concise, readable, and actionable, Domain-Driven Design Distilled never buries you in detail–it focuses on what you need to know to get results. 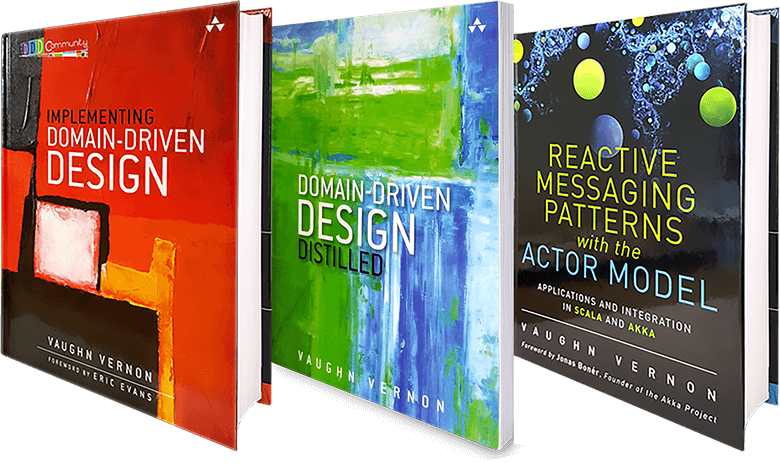 Vaughn Vernon, author of the best-selling “Implementing Domain-Driven Design,” draws on his twenty years of experience applying DDD principles to real-world situations. He is uniquely well-qualified to demystify its complexities, illuminate its subtleties, and help you solve the problems you might encounter. 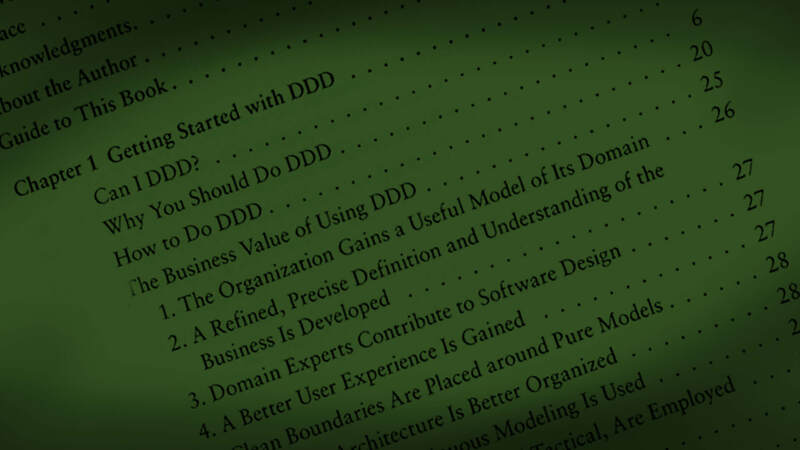 “Domain-Driven Design Distilled” brings DDD to life. Whether you’re a developer, architect, analyst, consultant, or customer, Vernon helps you truly understand it so you can benefit from its remarkable power. “Reactive Messaging Patterns with the Actor Model” enables enterprise developers to solve complex application and integration problems that were nearly impossible to address before. Developers can build multi-core, multi-threaded, highly-scalable, high performance, low-latency systems, and write composable software that is event-driven, scalable under load, responsive, and highly resilient. Developers are increasingly recognizing the potential of these technologies, and companies including Lightbend, VMware, and SpringSource have recently released new tools for using them. Now, there’s a start-to-finish guide to using reactive programming and the Actor model with Scala and Akka: Reactive Messaging Patterns with the Actor Model. The book begins with a concise, usable review of programming with the Actor model and the Scala language and the Akka toolkit. Next, Vaughn presents a guide to achieving high performance using the threading model supplied with actor systems. Following this is an easy-to-adapt cookbook of solutions for message-based applications and integration. The detailed solutions address messaging systems, channels, construction, routing, transportation, endpoints, and system management. Each follows the proven format introduced by Gregor Hohpe and Bobby Woolf in their popular Enterprise Integration Patterns, while offering advanced solutions based on Scala and Akka. Using this guide’s insights and examples, you can take Scala programming to the next level, applying Scala with the Akka toolkit to achieve maximum organizational value.